1 - Open the door and look for a name printed into the metal plate running down the side of the door. The printed name is the brand of multipoint lock. 2 - If there isn't a name or letters on the strip then remove the multipoint lock from the door. With the lock removed, note the shape of the central body of the lock and match its shape with the photos of our door locks until you find a match. Comparing the above to photos on our Multipoint door Lock page, you can see that this one is a Mila door lock. 3 - Now that you have identified the brand you need to identify the locking points along the metal strip. The picture below shows the different types of locking points. 4 - If there are hooks or deadbolts top and bottom then you need to measure the distance between them in millimetres (see technical drawing below). 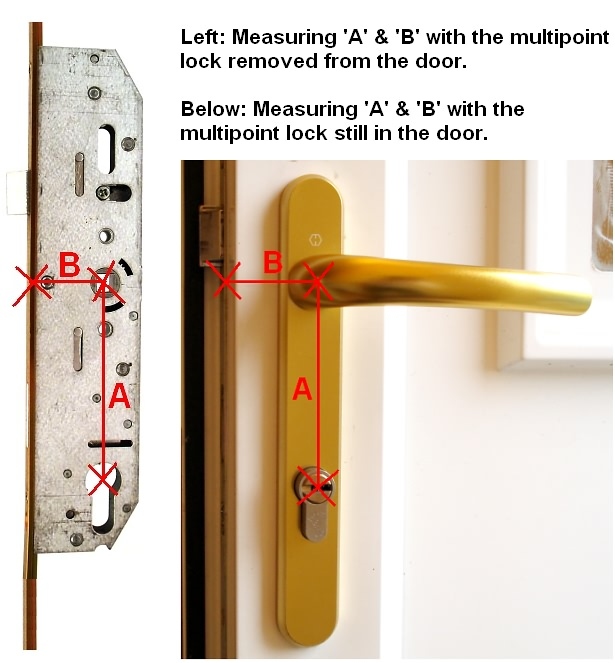 You can then compare that measurement to the measurements given for each door lock. Lever lever is when the door handle has to be lifted to engage the locks then turn the key once to lock. The door can be opened by pushing down the handle set from either side when unlocked. Lever Pad is the same as lever lever but a key must be used to gain access from outside even when the door is unlocked. Wind up is when the door key has to be turned several times to engage all the locks, the handle is not used to lock the door. 6 - Check the spindle to key measurement (Dimension A) and the backset measurement (Dimension B).